A quick n’ easy chickpea salad. Makes for great to-go lunches as well. DIY tortilla strips: Preheat oven or toaster oven to 375 degrees F. Brush 2 corn tortillas lightly with olive oil, sprinkle with a chili powder mix & mineral salt. Cut into thin strips, place on baking sheet in a single layer, bake in oven or toaster oven, rotating once, for about 10 – 12 minutes, until crisp and golden. 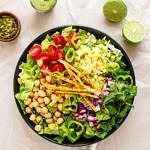 Dressing: Combine the ingredients for the cilantro-lime dressing in a small blender or food processor (I used the nutri-bullet). Blend until creamy stopping to scrap down the sides as needed every now and then, add extra water a little at a time as needed to thin. Taste for flavor adding anything extra. Pinch more salt? Pinch more cumin or squeeze of lime? Blend well. Salad: Assemble your salad by adding the romaine lettuce to your serving dish, top with corn, red onion, chickpeas, tomatoes, cilantro. Lastly, add pepitas (pumpkin seeds), tortilla strips and a good drizzle of the dressing and a squeeze of lime over top. If you don’t have a small personal blender, in a medium mixing bowl, mash the avocado with the ingredients using a fork or whisk, adding extra water as needed to thin until desired consistency. Blend until creamy. I haven’t tried doing it this way myself but I know it should be fine (just be sure to mince the cilantro well before mixing). The avocado will become smooth and creamy, especially with the addition of water and lime juice to help thin it out. It may just take a few extra minutes by hand. For a tangy dressing, try adding 1 – 2 teaspoons apple cider vinegar. If you have an extra avocado, add some diced to the salad.